In amazing voice for his 68 years, Joel initially noodled around on the piano keys with Beethovens "Ode to Joy" before launching into the opener, his biggest hit form 1978's "52nd Street" album, "My Life," and put in motion a near 3 hour mixed bag of an evening. While you would expect someone who has such a deep and vast catalog to stick to play mainstream hits all night, Joel's shows have proved to be anything but predictable. 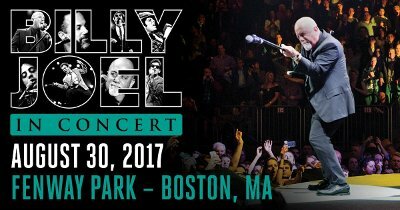 After pulling out "Pressure" and "The Entertainer," a nugget from 1974s "Streetlife Serenade" album, and a kitschy "Take Me Out to the Ball Game" (since he was deep in baseball territory at Fenway Park), Joel did the first, of four times during the night, in which he would throw out two songs from his catalogue, and let the audiences reaction decide which one to play. Tossing out two album cuts from 1980's "Glass Houses," the crowd picked "All for Leyna" over "Sleeping With the Television On." Then, turning to his breakout record, 1977's "The Stranger," the Boston crowd picked "Vienna" over his iconic ballad, "Just The Way You Are." After changing pace with 1989's "The Downeaster Alexa," another audience throw down saw "Zanzibar" winning over "Big Man on Mulberry Street." Joel went on to do several cover songs during the evening. As an unexpected treat, he did a moving version of Jimi Hendrix's "The Wind Cries Mary," and after mentioning the 50th anniversary of both the Summer of Love and the release of The Beatles' "Sgt Peppers Lonely Hearts Club Band," Joel, with help from guitarist/vocalist Mike DelGuidice, who handled the Paul McCartney part of the song, did a dizzying take of "A Day In The Life." After banging out some more classics; "Movin' Out (Anthony's Song)," "New York State of Mind" (which was played while an impressive backdrop of the New York City skyline almost popped off the concert screens), "Allentown,"and the a cappella tune, "The Longest Time" (another choice song which beat out "The Ballad of Billy the Kid"), Joel went into a very unexpected cover, with Don Henleys "The Boys of Summer" (his first nod of the night to The Eagles, as he also performed "Take It Easy" later on in the set). And, with what has now become a pretty standard site at a Joel show, he bought out his roadie Chainsaw, who manned the mic and tore through an impressive cover of AC/DC's "Highway to Hell, during which Joel donned an electric guitar, which he kept on through the follow up, "We Didn't Start The Fire." Joel's aforementioned guitarist/vocalist Mike DelGuidice, who had impressed earlier on "A Day In The Life," floored the audience with his version of "Nessun dorma," which was taken from Giacomo Puccini's opera "Turandot," and the perfect way to lead into Joel's epic "Scenes From And Italian Restaurant" and the set ending "Piano Man." After a short break, Joel returned to give one of the most generous encores seen this summer. The timeless "Uptown Girl" showed Joel's range is still intact, while his bad bad Rocker/party days were on full display on "Its Still Rock and Roll To Me" and "Big Shot" (a great nod to 70's excess). And, "Only The Good Die Young" led into his standard closer, "You May Be Right," and the Fenway crowd could not help but be elated at such a stellar encore. Here's hoping Joel returns to Fenway in 2018, and even makes it an annual event.